One of the perks of working in a bookshop is that we often get proof copies of books from publishers long before they’re released to the general public. This is particularly delightful when there’s a cookbook that I fancy. The only problem that I’ve noticed more and more since being on the low FODMAP diet however, is that a huge number of cookbooks use onion and garlic as the base of their recipes. I like to view this as a challenge though and I try to adapt the ingredients so that I end up making a version that’s low FODMAP and won’t cause me any digestive discomfort. 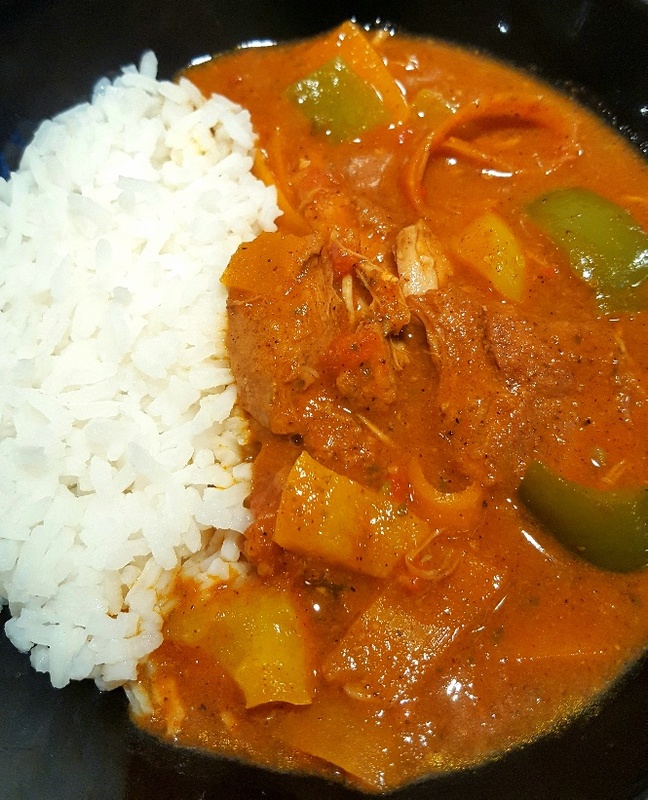 One recipe I came across in a Caribbean cookbook a while ago was for a Caribbean pork stew, but it was packed full of onion, garlic and higher FODMAP vegetables, such as a lot of sweet potato, sweetcorn and peas. Now, I think that if you substitute a lot of the ingredients for lower FODMAP items Caribbean cuisine can actually be quite FODMAP friendly and very tasty indeed. 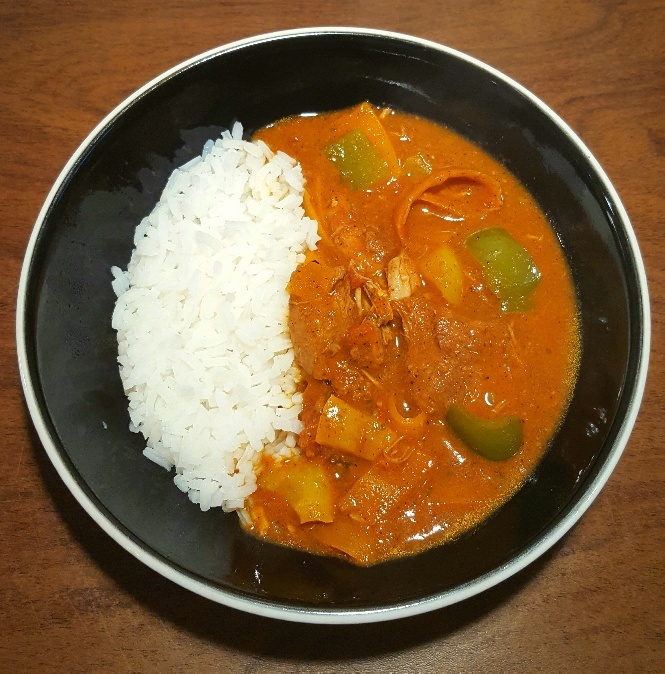 This slow cooker Caribbean pork stew certainly is! There can be no denying that autumn is coming in fast, especially now that the mornings are frequently shrouded in thick Scottish mist and Jack Frost has started to nibble my fingers as I walk in to work every morning through the dry, crisp, desiccated red and gold-coloured leaves that line the pavements. In light of this, I always think this a good time to get the slow cooker out and prepare something in the morning that I can look forward to having for dinner to warm me up after walking back home. Slow cooking this Caribbean pork stew really does the ingredients justice because it allows the flavours to meld throughout the day of slow cooking, producing a rich, fruity casserole that’s filled with well-seasoned pork shoulder and fresh vegetables. Trust me, if you want to stave off the colder weather that’s on its way you couldn’t get a better meal than this sunny Caribbean pork stew! Put your slow cooker on low and add the tin of chopped tomatoes and diced pork. If you’re using a Nutribullet or high-powered blender, put the coconut milk, fresh coconut, root ginger and all of the spices in the Nutribullet and blend until it’s smooth and then add the mixture to the slow cooker and stir well. If you’re using a spice or coffee grinder , grind the spices until they are powdered. Add the spices to the slow cooker along with the vegetables, coconut milk, creamed coconut and mince the root ginger and add that too. Mix well and leave to cook for 5-6 hours (depending on your slow cooker ). Serve with rice and Bob Marley tunes playing in the background.